The second half of the Morgan Grand National kicked off with the same excitement that filled the ring in the last class of the previous night. The Grand National Park Saddle Stallions had closed out Tuesday evening with Melissa Ann Cribley-Wahl making the winning ride. She was back in the first class Wednesday morning, this time aboard WWW Virtual Reality for the three-year-old park mare and gelding win for Nielson Living Trust. Representing the Northeast, Luman Wadhams followed in the ribbons, riding Ultra’s Special Delivery for Deedee Ludlam. 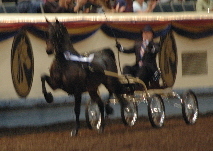 With a balanced trot, Red Zone had his ears up pass after pass and won the Grand National Pleasure Driving Gelding title with Lynn Peeples on the lines. Lynn and Kathleen Peeples own this bright and upheaded chestnut. Sammi Hazen took over the lines of daughter Jennifer's charismatic newly purchased HVK Winter Rose to garner the red ribbon directed by Tim Roesink. Something Wicked’s style and grace made her a standout in the Grand National Park Saddle Ladies Mare competition. Under the Rand banner, Kristen Johnson had the winner in perfect order for the unanimous win for their second victory pass in as many days for Dr. Grace Steere. Mantic Boogie Belle and Joan Bowers made their cheering section proud when they were called out as the reserve champions. The Grand National English Pleasure Amateur Stallion competition was a thrilling class that hosted a stellar group of top winning entries and their amateur riders, including Amy Gatewood, Shannon Connor, Karie Miller, Elizabeth Melanson and Dr. Kevin Schengrund. Judges Lonnie Lavery, Lewis Eckard, and Phil Price were in agreement that the impressive CCR’s Outrajus Corajus deserved to be in the winner’s circle. Karie Miller showed her talented stallion to this victory for the second year in a row for the Gerry Rushton Stables team. Amy Gatewood and defending world champion Nicoria had a fine ride as well as they emerged as the reserve champions under the direction of David Rand for DanTree Farm. The tricolor entries from the Five and Over Mares In Hand battled once again for top honors, only this time it was in the pleasure driving division. Prada showed off her designer style to earn the victory pass with Robert Hughes on the lines of Blackridge RJH. Long Acres Broadway turned in a bold performance to earn the Pleasure Driving Mares reserve finish driven by Kurt Hufferd for A. Russell and Jeanette Quilhot. Nineteen amateur riders were fresh and ready to ride hard for the esteemed Grand National English Pleasure Amateur Gelding title. Not too far into the class, one horse cast a shoe and the farrier was called in to assist, giving entries a chance to catch their breath. Without a doubt, it was a good decision for this entry to replace the cast shoe, because they went on to win the class. No Doubt and Debra Hurst Walters maintained a great position throughout the busy class and were rewarded for their skillful performance with the blue. Boston’s Big Whammy and Cassie Stevenson were thrilled when they were named the reserve champions while multi-titled Silversides Toy Soldier held his own for the yellow ribbon with Mary Fisher Davila up. The list of impressive ribbon winners in this deep class included the likes of top champions Gradell's Wild Reflection, Gotti, Marin Five-O-One, Roadshow Steppin' Out, Trinity So Rare, Baccarat Noble Cause and Cabot French Pepper. The park horses were primed up for the next class, the Grand National Park Saddle Three-Year-Old Stallion. TES Annuity’s quality and presence prevailed with Judy Whitney Harris aboard to carry the blue ribbon honors back to Thomas Schubert. Wendigo Lord Baden Powell, a promising Jessica Mullholand entry ridden by Lyle Wick followed in the ribbons for reserve. An abundance of prize money was at stake in the next class, the World Futurity Classic Pleasure Driving Three-Year-Old class. Dragonsmeade Bravura (Beethoven x Black Tie Debutante) and Iann Fu Longenecker added a beautiful set of roses and tricolor to their extensive collection for Dragonsmeade under the Blackridge banner. 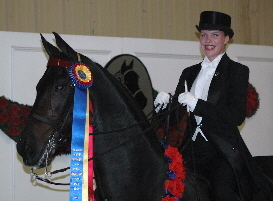 Libretto’s Bravado (Stonecroft Byzantine x Merriehill My Tyme) and Janelle Schroeder had the style and cadence it took for the reserve world championship title for Cadence Farm LLC. The pleasure horses were in the ring once again Wednesday morning, this time going for the three-year-old mare title. Tim Roesink was back in the winner’s circle following a grand performance by the lovely Paradigm Hot Chocolate for Copper Beech LLC. Luman Wadhams took home his second three-year-old reserve of the day as he directed Starboard’s Ring My Bell to this strong finish for South Bay Morgans. Three junior exhibitor drivers made a stunning entry through the gate behind the lines of their fiery entries for the second to last class of the morning session, the Grand National Park Harness Junior Exhibitor 16 & 17 class. FZM Encore’s flashy presence could not be denied as the defending champion was driven by Sasha Klein and trained by Waterford Farm, to be named the champion for the Brown/Klein family. The Ann Anderson-trained RFF Stars N Stripes and Steven Handy cruised to the reserve finish. Wednesday morning’s agenda closed with the Grand National Amateur English Pleasure Mare class. Karie Miller finished off a great morning when Versace was named the unanimous champion. This talented mare is trained by Keith Nelsen for Donna Woolley. Silent Wings and Kathy Papola trotted away with reserve in the 10-entry class following a poised ride for Baccarat Farms. After a nice lunch break on a beautiful Wednesday afternoon, Bill Carrington welcomed the first class of the 15 slated for the session. MEM La Vida Loca and Katie Cook livened up the day as they topped the Grand National Pleasure Driving Junior Exhibitor 16 & 17 class unanimously. It was a memorable victory for the Gerry Rushton Stables trained team. The defending world champions Aristocraticallee and Zachary Howa distinguished themselves as the reserve champions under the guidance of Luman Wadhams. The World Champion Classic Pleasure Saddle Junior Exhibitor 13 and Under made their way into the ring next. The class was filled with talented young riders and when the cards were turned in, all of the other entries hailed to the world champion team of Tyler Hufferd and the dynamic bay All Hail To The Chief. 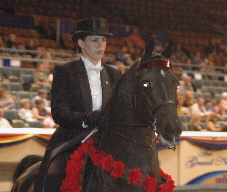 It was the second consecutive world title in this division for the accomplished young rider as he guided Julie Spanbauer's entry to this year's title directed by John Hufferd. Manistee Lee Mistral never dropped an ear as Hannah Bornt directed the sharp Tug Hill Commando son to a stellar reserve finish under the direction of Keith Friday and Alicia Groff. Celebrity Marquee and Lauren Griffin starred in the next class of the day. This polished pair ruled in the Grand National Park Harness Junior Exhibitor 15 and under class in just their second show together under the Bobbin Hollow banner. The always bright Charlestown Michael and Emily Vlisides received the crowd’s appreciation as the exited with the red ribbon. Sixteen of the industry’s youngest riders had no fear as they presented their trusty mounts in the Grand National Walk -Trot 9 & Under Finals. After working two splits both ways of the ring, the top 12 took the rail once more for a final evaluation by judge Wright, McDonald and Swanson. Fair Haven Federal Xpress’ endurance paid off as this consistent performer with his smart rider Sara Heidenreich won the tough class. Receiving a first place vote of their own, Tu-Kan’s Rambunctious and Sara Cleland represented the state of Washington for reserve. TJB Opinionated and Nicholas Roberts earned the yellow streamers to make their fan club very happy. Following the walk and trotters, another finals class took the track. RJM Roulette and Janet Morgan topped the large field of lady amateur drivers for the second year in a row, much to the delight of trainer Mike Goebig. The crowd-pleasing pair of Dragonsmeade Divine Miss M and Iann Fu Longenecker were crowned the reserve champions in the 13-entry class for Dragonsmeade. Also representing the Dragonsmeade breeding program in fine fashion, Dragonsmeade Virtuoso and Judy Kjellander were a stylish presence for the third place award. New to the Grand National coliseum, 11 young western horses performed next in the World Champion Futurity Western Pleasure Three-Year-Old class. It was a very calm class as all 11 entries proved they have the manners it takes to succeed in this division. After the rail work was complete, the panel inspected all of the horses on their conformation. When calculations were complete, Daryl Hopson and Bears Covergirl modeled for Howard Schatzberg in the presentation area. By Ultras Special Agent and out of Lookaway’s Krystal, this pretty mare collected $2130 and the world title for owner Nancy Jewell. Worked In Gold and Jeffrey Bessey continued to shine as the reserve champions for Francis Beers. 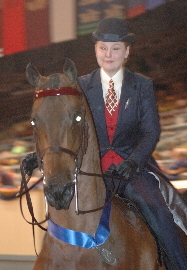 Fifteen riders showed next in another finals class, the Grand National Walk-Trot Hunter Pleasure 10-11 Finals. Jax Noble Onyx managed the competition just fine and picked up another victory this week. Miranda Scholl kept the world champion in all the right places for the win for Gayle Singer. Heyday Rising Sun and Ariel Blackett put on an impressive performance and finished the class with the reserve championship under the Cedar Spring banner. The best entries from the grand national junior exhibitor pleasure driving competition met face to face for the 13 and under world championship. This class contained a fantastic group of horses, and the young drivers did a superb job of presenting their horses for judges Matthews, Eckard and Lavery. When the order of finish was announced, it was a beaming Sammi Hazen who coached nephew Austin McLallin to his first world title on the lines of the expressive On A Mission MEM. After winning their qualifier earlier in the week, AFF Leroy Brown and Katherine Alderman settled for the reserve position with a bold performance. Joan Bowers and the eye-catching Mantic Excalibur were deemed victorious in the Grand National English Pleasure Three-Year-Old Stallion and Gelding class. MEM Indecent Proposal and Jeff White made a more than decent case for themselves as the reserve champions for Mendonhall Inc. The marathon session continued with another set of junior exhibitors vying for victory with their pleasurable driving horses. Formal Tempest and Merin Maggi bested the class while Paparazzi and Stephanie Marcelonis made a strong case for reserve for CPM Stables. CN’s Stylish Debut was indeed stylish for the Grand National Park Saddle Ladies Gelding title with Allyson Wandtke in the irons. This entry earned his second victory pass in as many days directed by Mike Goebig for Cindy Nord. 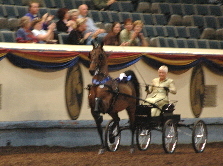 Judy Whitney Harris and defending world champion Bellisimo rode up for reserve honors this time out for Barbara and Arthur Jones. The World Champion Futurity Pleasure Driving Two-Year-Old was another very large class and was therefore split into two sections with the best of each section, 11 in all, returning to the coliseum for additional work. 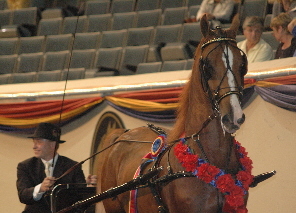 Standing out from the pack, RJMF Barrymore, the leg-waving chestnut with four white socks, was named world champion with Jason Wolfe driving for Morgan Horse Farm. Sired by Hollybrook Stage Rage and out of Honeytree Disco Queen, the flashy two-year-old earned $2700. Shanna Gish and SpringMill Souvenir (Nostradamus x CN Sophisticated Lady) had a great drive and picked up $1700 for SpringMill Morgans as they garnered the reserve world championship. Colleen Wick guided the promising Mary Todd Kaercher entry Love Her Madly (Astronomicallee x NBN At Your Command) to the third place finish. The hunter and jumper entries had been competing for their grand national titles for three days in ring 9. They got to show off their winning style in the coliseum as they were awarded their high point world championships on Wednesday afternoon. Included the list of champions who entertained were Wintergreen Don Diego and Susan Garmier, That’s My Nick and Amanda DuPont-Pauli, PKF Hollywood and Kayla Suzanne Reser and Wintergreen Commando and Geneva Milliken. The Classic Pleasure Driving Gentlemen’s Finals invited 13 dapper gents into the ring. With organist Nancy Roberts playing "Hit The Road Jack" it was some added incentive for Jack Gatewood as he guided the lovely Cedar Creek Vizcaya to the tricolor for DanTree Farm. It sounded like the whole state of Texas was cheering on John Green as he was announced as the reserve champion on the lines of Roadshow I've Got Rhythm. The Four-Year-Old Hunter Pleasure World Championship closed out the afternoon session with 17 impressive young athletes filling the ring. For the fourth time in the last five years Kathleen Peeples was aboard the pre-eminent entry in this division. 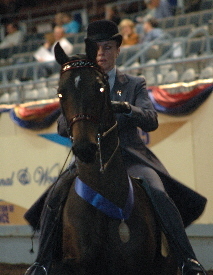 This time the fluid-moving Born To Boogie daughter Let's Boogie carried the world title home to proud owner Cynthia Brown-Clark with a pair of first place votes. Dreamaker Whatta Sight and Amanda DuPont-Pauli finished off another impressive season for Jane & Robert Thompson as the reserve world champions. Peter Fenton called 12 finalists into the coliseum at 7 p.m. sharp Wednesday to compete for the highly anticipated AMHA Saddle Seat Gold Medal Finals. The riders had qualified earlier in the week in their preliminary competition and the best of that group performed in front of judges Donna Pettry Smith, Maria Gilman and Cecile Dunn for this class, which they’ve prepared for all year. Following rail work, all 12 entries entered the ring one at a time to execute the workout, which had been posted prior to the class. Each rider put forth terrific effort in performing their patterns and following the 12th rider’s pattern the tabulations were made and 10 riders were called back into the coliseum in numerical order for the presentation of awards. Anticipation levels escalated as specta tors and exhibitors awaited the call. When the cards were tabulated, Brooke Gove was ushered into the winner's circle for the victory. Mounted on Hollybrook Romeo, she made the memorable victory pass under the guidance of Kristen Spann and David Cater of Cricket Hill Farm. The poised and polished Emily Buchanan proudly accepted the reserve award matched with CO Perfect Timing by instructor Cheryl Manahan. The lineup of top ten riders also featured Tiffani Earehart, Jamie Cruz, Ashley Dragan, Marlo Franco, Maggie Janzen, Morgan Glenn and Brooke Yule. While the first class of the evening took nearly an hour, the second class of the session was over in a flash. Four awesome roadsters revved up the crowd for the Grand National Roadster Under Saddle Amateur Finals. Indeed a crowd favorite, Daring Caressa’s Spirit and Liz Connor dared their competitors to bring it on, but no one could catch them as they raced all the way to the winner’s circle as Judy Whitney Harris coached them to the unanimous victory. Primary Investment GP and Shelley Silber were hot on the winner’s heels for reserve honors for Kourt Jester Morgans. The third of eight classes on the night made took center stage in the coliseum next as 13 silver-laden entries competed for the World Champion Western Pleasure Junior Exhibitor 13 & Under performance. There were some gorgeous western horses in this class and several of the horses had résumés to prove they were worthy of the win. The class closed with Peter Fenton inviting the magnificent Bear Brook Supreme Bar and Anna McLallin to make the unanimous victory pass for Bill and Sammi Hazen. It was a memorable day indeed for the Hazen family as both Anna and younger brother Austin earned unanimous world championships. Chisholm is always a treat to watch and this tried and true mount jogged away as the reserve champion with Leah Soubel riding. 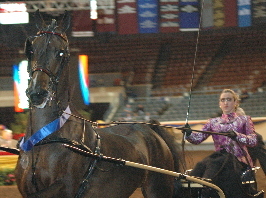 The athletic bay SpringMill Sequel and John Huse paraded out of the coliseum as the Grand National Park Harness Amateur Mare and Gelding Champions with Kurt Hufferd coaching on the sidelines. The airy-going Silverheel’s Synergy and Bob Neimeth exited with the red ribbon finish, pleasing their Misty Meadows fan club. The Amateur Hunter Pleasure World Championship featured a ring filled with 24 of the finest in the world battling for the roses. After a nearly five minute break to replace a cast show, the judges chose their favorites and the tabulations were made. It was then time to greet the champions as Glacier Dreamin’ and Monty Kugeler's dream came true as they earned the world championship to the delight of The River's Edge team. Ha-Ho Windstar and Bre Schultz remained steadfast throughout the competition and garnered the reserve world championship directed by Katie Mair. The outstanding top ten lineup also featured En Excess NKS and Julie Chan, Jax Noble Onyx and Whitney Singer Porter, Firecrest E-Ticket and Keston McDonald, FCF Valparaiso and Jennifer Cooley, Manchester In Demand and Misty Pleiness, SpringMill Primary Colors and Martha Simpson, B-L Hana Bak Ibsen and Lillian Thomas, and Shaker's Maribeles and Judy Fox. One of the highlights of the nights captured the attention of audience members next as four outstanding entries played up their best assets in the Grand National Pleasure Driving Stallion class. The judges were unanimous in all four places in this class and topping the cards was the stunning and popular LPS The Boogie Man with David Rand on the lines for Michael and Nancy Ramsey. Percy McDaniel had MEM Just My Style looking terrific for reserve, making owners Clint and Linda Barber very proud. The World Champion Classic Pleasure Saddle competition was immense and all entries put their best efforts toward being seen in the busy class. Boogie Night‘s confident presence prevailed unanimously in the 21-entry class, with a poised Dawn Fire riding for Peeper Ranch under the direction of Phil Fountain. AMHF Absolut Mystery and Debra Hurst Walters turned in an eye-catching ride to add the reserve world championship to The River's Edge banner. The Hurst sisters were battling for top placement as Leslie Hurst was aboard junior champion Abracabam to earn the yellow ribbon for Boston Morgan Farm in this deep class. Nine prime time players converged for the final class of Wednesday evening. Shortly after the gate closed, one entry cast a shoe and decided to withdraw from the competition. The crowd picked out their favorites and at the conclusion of the class the mighty Evolution conquered the honors in unanimous fashion for the Grand National Park Harness Amateur Stallions title with Donna Zimmerman on the lines. The stellar symbol of Morgan Park Harness, And The Beat Goes On and Iann Fu Longenecker had their crowd support for reserve to cap an outstanding evening of competition. The cool, sunny morning was devoted entirely to western equitation. As the judging panel of Cecile Hetzel-Dunn, Bill Hughes, and Diane Morgan-Stasiak prepared for their duties, twelve young riders filed into the ring to the call of announcer Mary Loy Brown for the Walk-Trot Western Seat Equitation 10-11 Finals. Sitting tall in the saddle and legs perfectly still, Shelby Clark was called for the first championship of the day riding TCS Supreme Aire. Proudly receiving the reserve was Amber Bornt on Ellen McQuade’s Kane Creek Kryptonite under the direction of Keith Friday and Alicia Groff. Both of the top two places were unanimous decisions of the panel. 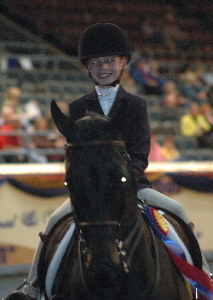 The youngest riders of the day were the next to show in Grand National Western Seat Equitation 9 and Under Finals. Wearing the tricolor on her victory pass was Sara Heidenreich riding the veteran Fair Haven Federal Express. Pert and poised, she rides under the instruction of Crystal Farms. 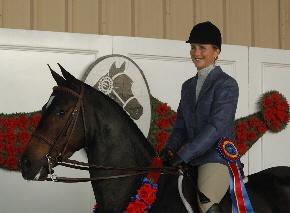 Reserve champion in this Grand National finals was Jenny Miller riding four-year old Morgan Valley Apollo, instructed by Lori Marino-Beasley. Fourteen of the oldest riders got the chance to show their skills next in Western Seat Equitation 16-17. For the third class in a row, the winner was a unanimous selection. Ellen McQuade smiled broadly on her victory pass aboard Kane Creek Kryptonite with Alicia Groff jogging alongside. Reserve in this deep class was Brittany Clark on TCS Supreme Aire, also his second class of the day. 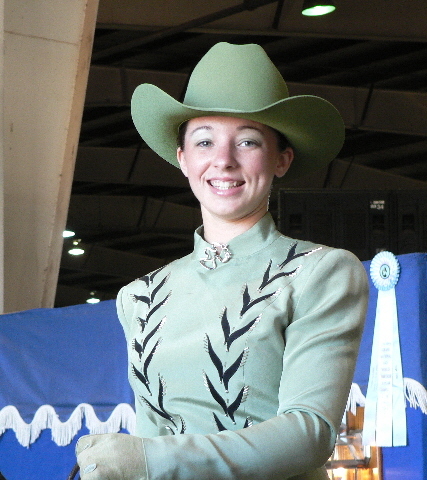 The Western Seat Equitation 14-15 featured twelve accomplished riders. Catching the eye of the judges was Natalie Nelsen riding QVM Collector’s Edition. She was met in the winner’s circle by Sandy Sessink. 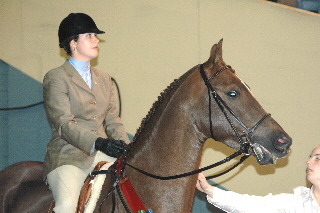 In reserve was Kali Erin Hutchinson riding HyLee’s FanFlaire and instructed by Mary Carlton. Ten confident 12 and 13 year olds jogged in for their western seat equitation class. Demonstrating perfect form to the approval of the panel was Leah Soubel on the veteran Chisholm instructed by Lori Marino-Beasley. Reserve in the ten rider field was Lauren Little on the veteran Evil Kneivel. Wrapping up the day’s equitation competition, the 11 and under contenders rode with quiet determination. In a huge win in her young career, Cheyenne Rumens was named the unanimous winner to the vocal support of her fans. She was riding Temptation’s Answer for her family’s Fire Run Farm. In reserve was Jordyn Smith riding Cedar Creek Yavari. The working hunters under saddle were next on the schedule although their competition was moved to Ring 9 for the convenience of the judges. Wintergreen Don Diego and Susan Garmier picked up another victory while PKF Hollywood and Kayla Suzanne Reser finished in reserve in this five entry class. The abbreviated afternoon session featured two most entertaining carriage driving classes – Double Jeopardy for single and multiple teams. In the singles competition Wintergreen Sultana and Jill Countryman added the victory with I'm Irish driving away in reserve guided by Valarie Siemer for Lora Dunlap. Denbury Irish Justice and Denbury Regal Justice continued their winning streak with an entertaining drive for James Brown in the multiples class. The hunter/jumper competition closed out in Ring 9 on Wednesday morning. Wintergreen Commando and Geneva Milliken were the first winners of the day in the Working Hunter II where Derwanda Hercules and Gayle Davidson finished in reserve. LR Amie Savoir Faire and Mallory Mignot leapt to top honors in the Jumper III for Anne Mears while Wintergreen Commando and Geneva Milliken finished up in reserve this time out. The Low Working Hunter Under Saddle saw Melendy Cash Bonus and Fawn McDaniel earn a trip down victory lane. Three D Renegade and Hillary Wiles-Lafayette followed up with the reserve ride in the field of 14. Melendy Farm was right back in the winner's circle as Laurel Robinson matched up with Melendy Cash Bonus for the Working Hunter Amateur Finals. Here, Kayla Suzanne Reser guided PKF Hollywood to the red ribbon. Wintergreen Commando and Geneva Milliken added another title to their collection in the Working Hunter Junior Exhibitor Finals. 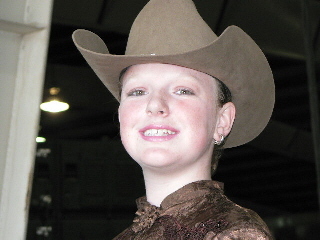 This time Kelsey Robinson was aboard Melendy Cash Mare to add the reserve title to the Melendy Farm's accomplishments. Kate Podell showed off her winning form in the Hunt Seat Equitation Over Fences aboard Wintergreen Sultana coached by Lance Wetmore. Geneva Milliken and Wintergreen Commando finished off a busy morning with the reserve tie.